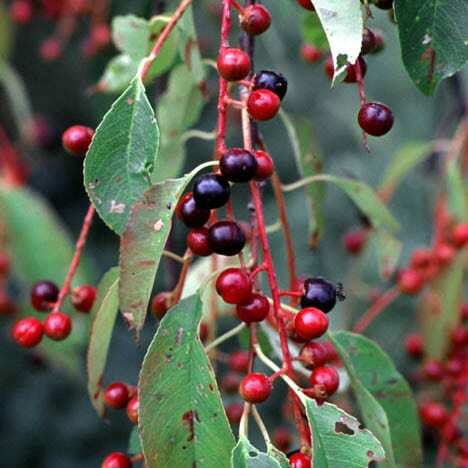 Chokecherry is a small suckering hardy tree or large shrub. Distinguished from the Pin Cherry by the leaves. The Chokecherry has broader, egg-shaped leaves and dense, elongated, terminal white flower clusters. May also be mistaken for the Mountain Juneberry. Identification can be made by observing the leafstalks; the Chokecherry leaves have glandular leafstalks while Mountain Juneberry leaves do not. Chokecherry fruits turn dark purple and are edible in July and August.